Get on yer bike and Vote! Home / Steve Tollestrup / Get on yer bike and Vote! It’s the last weekend of the election and there are only five days left to post your vote (though up until Saturday October 9th, 12 Noon you can drop off at any public library). Its time to make the right decision and vote for Future West. Campaigning door to door and meeting with residents I have found that the protection of the ranges is raised repeatedly. Let’s be clear with no spinning, electioneering or out-clause; Future West believes the current legislation protecting the ranges is sufficient and no softening or backtracking is justified or required. Future West stands for the protection of the Waitakere Ranges and coast. Vote Future West. When we say we are about “Your Street not Queen Street” we mean something much more than a clever slogan. We are standing for a West with a voice and a community that is going to stand up to Queen Street financers, Epsom Act members and inner city National Party blue rinse set. Again we are clear that the foremost role of local boards is engagement with the local communities they serve and ensuring their voice and their concerns are vigorously supported and advocated for. Vote Future West. Let’s be clear it takes a team to do that, not flip-flopping independents that can be picked off easily by smooth talking central government suits or CCO executives out to flatter them. 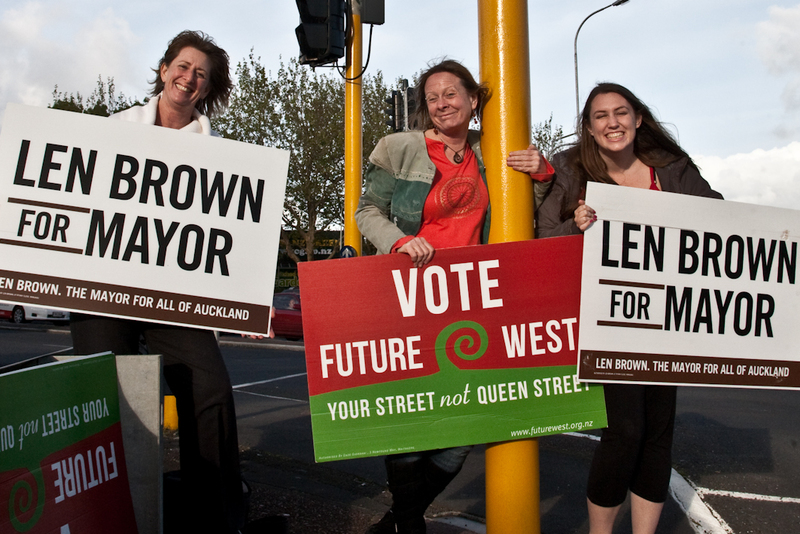 Let’s again be honest, there are only two teams on this election ticket – Future West and Citizens and Ratepayers. One stands for Community, Environment and Democracy, the other stands for the surrogate policies of their National and Act funders, and the divisive politics of John Banks. Vote Future West. This is the final weekend and returning officers note that the majority of eligible voters have not yet sent in their ballot papers. This is too important an election to ignore. This is Your West, Your Voice, Your Board- care enough to vote. Vote Future West. Protection of the ranges and coast. Heritage conservation and quality urban renewal. Sustainable, smart and innovative economic and business development. West Auckland assets remain Council controlled. No excessive waste water charges. Modern and effective transportation services that include outlying and rural communities. Well said Steve and very appropriate for a Green!